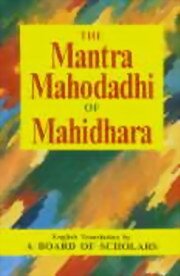 The Mantra Mahodadhi of Mahidhara - English translation by A Board of Scholars. Among the medieval works on Tantra, this work in Sanskrit holds a place of great importance for its comprehension and authority. The author, who describes himself as an anchorite who did austerity in Varanasi, prepared this book in twenty-five ‘Tarangas’ more as a compilation of relevant material for the sadhakas than as an independent work. It is encyclopaedic in nature; it is verily an ocean (as the title suggests) of mantras. Now in Tantrik sadhana, the mantras are of great significance, for they are sufficient means of visualizing the Gods. Indeed the mantras are the "body" of the Gods. There is thus a correspondence between the mantra (formulation), murti (visualization), and the Tantra (actualization). This correspondence is the theme of this work. Exceedingly valuable for the spiritual practitioners and extremely popular among them in the North as well as in the South, there was till now no translation of this work into English. Great was its need. Sri Satguru publication of Delhi have therefore to be congratulated for making this monumental work available to the English-knowing folk. All the 3,300 verses of this work (completed in 1589 A.D) have been literally rendered into easy English with the help of the author’s own commentary called Nauka. The board of Scholars who have completed this arduous undertaking have done a fine job, and richly deserve our praise. They have filled a lacuna that was keenly felt. "There is also an excellent introduction to the art and science of Tantra, as also an analysis of contents. There are, at the end of the work, illustrations of yantras, which are reproduction of the same drawings as were in the lithography copy of the book. It is a very useful publication, and will be a addition to the Tantra literature. Bhutasuddhi (purification of the elements), Pran-pratistha (instilling of vital airs), the Matrka Nyasa (fixing, depositing), Purascarya (preliminary observances), Homa (offering of the fire), Tarpana (libation) etc. The various Mantras of Ganesa have been explained perfectly. The Mantras of Kali, the deities entitled Kali and of Sumukhi are explained. The Mantras of Goddess Tara Ekajata, etc. Different Mantras of Goddess Tara Ekajata, Nila Sarasvati. The Mantras of Goddess Chinnamasta, Sabri, Svayamvara, Madhumati, Pramoda and Bandi Devi. The Mantras of Vatayaksini, Varahi, Jyestha, Karnapisacini, Svapnesvari, Matangi, Banesi, Madanesvari and so on are explained. The Mantras of Goddess Bala and Syama and her various aspects have been dealt with in detail. The Mantras of Annapurnesvari, and her aspects Mohana Gauri, Jyesthalaksmi and Pratyangira, destroyer of enemies have been explained. The Mantras of Bagalamukhi and the two Varahis. The Mantra of Sri Vidya with various Mudras and Nyasas has been explained. The Avarana deities of Sri Vidya have been explained. The Mantras of Hanuman has been dealt with in detail. The Mantras of Visnu, Narasimha, Gopala and Garuda. The Mantras of Sungod, Kuja, Brhaspati, Sukra and Vyasa. The Mantras of Mahamrtyunjaya, Rudra and Kubera have been explained. The Mantras of Kartaviryarjuna, Dattatreya, Jahnavi, Manikarni have been explained. The Mantras of Kalaratri and the nine syllabled Mantras of Candika have been explained. The Mantras of Kukkuta, Sastr, the procedure regarding the worship of Parthivesvara, Yama and Citragupta and Asuri Vidya. The various kinds of Yantras and Svarnakarsana-bhairava have been explained. The procedure of adoration beginning with ablution and ending with Antaryaga have been explained. The details have been explained beginning with Arghya Puspanjali, etc. and ending with offering of flowers and other varieties. The worship with Damanas flowers and Pavitras has been explained. Explained of the verification and purification of Mantras Sodhana. The six types of rites Santi, Vasya, Stambhana, Deesa, Uccatana and Marana have been duly dealt in detail. General notes and clarifications. Yantras. This becomes very difficult for an ordinary reader to make practice out. Do not attempt certain vidyas without seeking guru, The consequences sometimes may be hazardous and by my experience everyone cannot perform each and every methods. This is a marvellous ancient treasure, and a rare book for your collection, reference and guidance. It explains the mantra shastra in depth and also renders higher knowledge of indian occult science. May be a reader or a practitioner; I recommend to have one. This becomes very difficult for an ordinary reader to make p ..